Faces of Camp Pinebrook Feature: Introducing Jake + Hallie of the Be’er Sheva Bears! 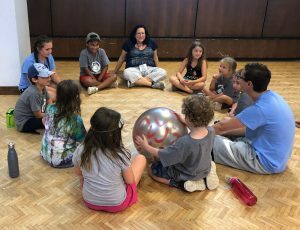 Our oldest campers this summer belong to the Be’er Sheva Bears, and they are led by a dynamic duo, counselors Jake and Hallie. 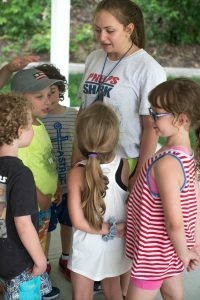 Your children start every day with a warm hug or enthusiastic high five from Jake and Hallie, and they in turn love spending their days doing everything from swim to distributing fruitcicles with their campers. Here are some fun facts to know about Jake and Hallie! New Rochelle natives, both Jake and Hallie grew up here in New Ro and graduated from NRHS. Hallie is also a college student, and she is about to begin her studies at Elon University in North Carolina where she will start studying communications. Both Jake and Hallie are athletes — Jake played varsity tennis and Hallie is a trained dancer with 14 years of experience and a preference for modern dance. Should the opportunity to dine with a famous musician arise, Hallie would go for Thai food with Bruno Mars and Jake would opt for gluten free waffles with his favorite Australian pop singer, Troye Sivan.